How can I get rid of pain between shoulder blades? Middle or upper back pain can occur anywhere from the base of the neck to the bottom of the rib cage just above the lumbar spine of the low back. It is very common to have pain between the shoulders but also radiating up into the neck and headaches at the base of the skull. 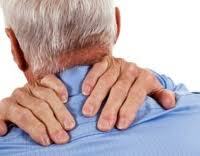 Upper back pain is less common than pain in other parts of the spine and back in general. This relative freedom from pain in the upper back (also known as the thoracic spine or middle back) is due to the difference in form and function compared to the neck (cervical spine) or low back (lumbar spine). The neck and lower back are designed for mobility, while the upper back or thoracic spine is designed to work with the 12 pair of ribs, breast bone in front, shoulder blades and collar bones to provide a stable base for shoulders, provide for an upright posture, and to protect the heart and lungs in the chest. 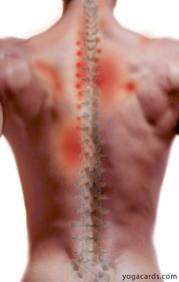 This area of the middle spine is more stable than the areas above and below it, and so provides only limited movement; this keeps the area from being stressed as much as other areas but when problems arise this protection works against the upper back by restricting how much can be done assist recovery. With this comparatively little motion and a great deal of stability throughout the upper back and thoracic spine, this area of the spine does not tend to develop spinal disorders as commonly as occur in the neck and lower back, such as a herniated disc, mechanical misalignment, spinal stenosis, degenerative disc disease, or spinal instability. When they do occur they tend to be less easy to correct because the presence of those same 12 pair of ribs, shoulder blades and collar bones that provide stability also reduce corrective movement of the structures of the upper back. When pain between the shoulder blades does occur it can be significant because off the greater number of articulations and muscles that work together in this area, as well as because of the constant movement of the chest during normal respiration. The lower neck, upper back and chest and shoulders share a complex of large muscles providing most of the work ability of the body share attachments to the should neck, upper back, shoulder blades, chest cage, and upper arms. This large complex interplay of muscles is prone to developing mechanical irritation (myofascial pain) in the upper back due to either de-conditioning (poor muscle tone due to lack of use) or overuse injuries (repetitive motions). Muscle strains, sports injuries, auto accidents, or other injuries can all result in pain from muscular irritation. When these upper back and neck muscles are irritated they will eventually go into a state of chronic spasm and contraction; this causes the muscles to excessively pull on their points of attachment to the skeletal structures (individual spinal bones, ribs, scapula, collar bone) and can eventually cause them to move out of their normal position or alignment in relation to each other. When this happens a series of compensation mechanisms occur that eventually result in altered alignment that is recognized as poor posture. As a result of the abnormal alignment the points of attachment are stressed and can result in arthritic changes and pain in the upper back. Only if pain is significant, should over-the-counter drugs be taken because pain generally has a positive limiting and warning effect to help the sufferer identify which postures and activities are aggravating the condition. If overwhelming, drugs to reduce pain can be used, such as acetaminophen (for example, Tylenol) and non-steroidal anti-inflammatory drugs (for example, Advil, Aleve, aspirin, and Motrin). Ribs and spinal bones connect directly in the upper back, as well as connect directly and indirectly with the shoulder blades, collar bones, breast bone and upper arms. All of these boney structures are held together by tendons and ligaments, while large nerve roots and secondary nerve branches run throughout the framework of the upper back. Any change in bone position or muscle or joint tension can result in irritation to nearby nerves, causing pain. When a joint is not lined up correctly it cannot work correctly, and this is called joint dysfunction. Joint dysfunction hurts because the body uses pain as a warning signal that it is “jammed up” in a particular location. Taking pain pains or muscle relaxants to reduce pain is a silly way to respond to this pain of joint dysfunction; the most effective and logical thing to do is to correct the joint misalignment so the body alarm goes off naturally. Effective treatment for joint dysfunction usually includes manual manipulation by an osteopathic physician or chiropractor to mobilize the joint and restore correct alignment to relieve the pain. Permanent relief often requires a home exercise and stretching program for the spine and shoulders, along with aerobic conditioning to maintain sustained upper back pain relief. The greater structural stability of the upper back (thoracic spine) tends to prevent disc herniations, spinal stenosis or degenerative disc disease from developing in this part of the body. As a result only 1% of all disc herniations occur in the thoracic spine and other degenerative problems are usually less advanced.